Maybe they want to sing on Broadway. Humpback whales, the gigantic, endangered mammals known for their haunting underwater songs, have been approaching New York City in greater numbers than even old salts can remember. Naturalists aboard whale-watching boats have seen humpbacks in the Atlantic Ocean within a mile of the Rockaway peninsula, part of New York's borough of Queens, within sight of Manhattan's skyscrapers. "It is truly remarkable, within miles of the Empire State Building, to have one of the largest and most charismatic species ever to be on this planet," said Howard Rosenbaum, director of the Ocean Giants program at the Wildlife Conservation Society. Humpbacks were spotted 87 times from the boats this year, and by cataloging the whales' markings, at least 19 different humpbacks have been identified in the waters off the city. Paul Sieswerda, founder of Gotham Whale, which documents the marine mammal population around New York, said reports of humpbacks in the New York Bight, where the city's harbor meets the Atlantic, began to pick up around 2010 from surprised fishermen and other veterans on the water. Gotham Whale then partnered with the American Princess whale-watching boat, providing naturalists who could document the sightings. The naturalists also do an educational presentation on the boat and answer customers' questions, said Tom Paladino, the boat's captain. "It was pretty slim pickings at first, actually," Sieswerda said. "We went on many cruises and had three sightings totaling five whales in 2011." But in 2012, there were 15 sightings; in 2013, 33; and this year there were 87 sightings totaling 106 humpbacks. Many whales were sighted more than once. By comparing flukes the distinctive shapes and markings of their tails 19 different humpbacks have been documented near the city so far. Customers on the whale-watching tours are asked to share any photos they get of such markings for the "New York City Humpback Whale Catalog." "This is the way they've been doing it in Maine and Massachusetts, the recognized way to keep track of these whales, study their behavior," Sieswerda said. It's not clear why humpbacks, which can be 50 feet long and weigh 40 tons, are returning to New York's shores, where they were abundant before they and other whale species were nearly destroyed by whaling. 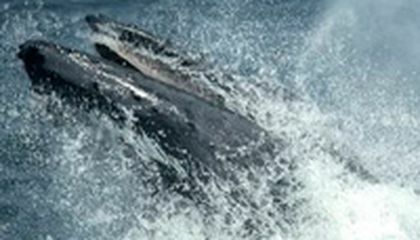 Rosenbaum said the humpbacks' reappearance could be simply a shift in their habits rather than a spike in population. A greater abundance of menhaden, one of the humpbacks' favorite foods, could have attracted them from farther out in the ocean. That might be because the water is cleaner. "One would like to think that some of this has been triggered by an improved environmental ethic," Rosenbaum said. "We have the clean air and clean water acts, the Marine Mammal Protection Act and associated state laws. It's hard to make the link for sure but there's certainly been a behavioral change toward the natural environment." Sieswerda agreed that various factors are in play but said, "I think it all begins with cleaner water," including the improved Hudson River. Whatever the cause, humpback populations worldwide are increasing. Counting whales is difficult, but the International Whaling Commission says its latest estimates put the worldwide population at about 150,000. About 11,600 of those are in the Western North Atlantic, which includes the New York Bight off New York City. There might have been just hundreds before whale protection laws were passed. New Yorkers shouldn't expect to see humpbacks frolicking around the Statue of Liberty. 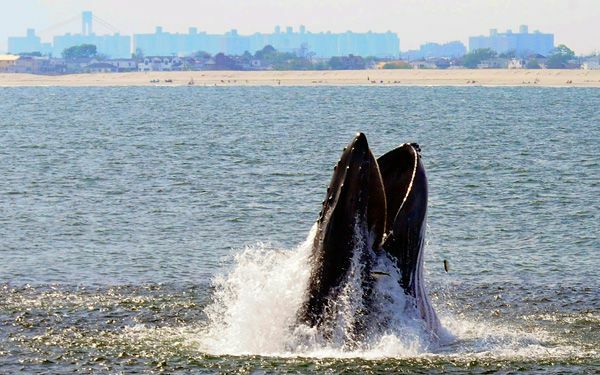 Except for the occasional disoriented calf, the whales generally stay well outside the harbor, beyond the "gate" formed by the Rockaway peninsula in New York and Sandy Hook in New Jersey. Critical thinking challenge: CTC: Why doesn't the International Whaling Commission know precisely how many whales there are worldwide? How can an entire country run out of butter? M - The Humpback Whales population is increasing and most of the Humpback Whales are in New York City and Maine and Massachusetts. E - The Evidence for this is that what it says in the article is that the Humpback Whales are increasing in their population and they are in New York City, Massachusetts, and Maine. Their is a lot of Whales in that specific area. A - I think that the population could be too much for this species soon they will be way too much whale and they will be in every ocean and they will be all over the world. L - The whole article is basically explaining that soon there wont be enough room for all these whales so after the population growth stops there will be no room for other water life animals. I find it truly fascinating that humpback whales were seen near New York City. I recently just visited New York City this past weekend, and I wish that I would have known about the whale sightings so that I could have tried to see them. I had to click on the article as soon as I saw the title. To add on, the first sentence intrigued me even more. I continued to read to find out that the sight seeing of whales in NYC has almost tripled in the past year. The Humpback whales are increases. They have been al over New York. It is good how they are all doing reports on the Humpback whales. They think they are increases in New York is because maybe the water is cleaner. Hump back whales are starting to invade the new york city. They think this because the water is cleaner. They usually stay well behind the "gate". There are only suppose to be calfs in this city. I don't think this would be a problem. I think they should allow a certain number of the whales to be hunted so there numbers don't overwhelm us. This number wouldn't have to be a big number just like a certain amount for each country for the amount in there areas. My friend was just in NYC this weekend and she told me that she saw whales and I didn't believe her. Then I saw this article and I thought it was so cool. It's awesome that there's proof that the water is becoming cuter. I wonder if there are any more concrete reasons for why this event is occuring. I would certianly hope the whales are not being forced closer, but rather the land has become availible for them, and they are taking the opportunity. That's extremely interesting. You wouldn't expect an I danger and intriguing animal like he humpback whale to be so close to such a densely populated area like Manhattan! Humpback whales taking over new York city. Well I don't think that it is that bad. I would find it cool that there are whales around the city. I think that a lot more people would go there to see the whales.